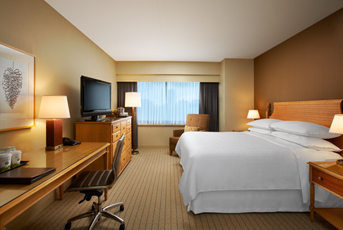 Situated in the city's vibrant core, the Sheraton Seattle Hotel provides a gateway to the diverse sights and sounds of the Pacific Northwest. Simply step out our front doors to find gourmet food, exciting entertainment, and world-class shopping. Nearby Airports - 15 miles from Seattle Tacoma Airport. Distance to Convention Center - Adjacent to the Washington State Convention and Trade Center. Stay connected in our 24-hour Business Center. Staffed Monday through Saturday, the business center offers professional event and business meeting support. Our high-tech business center features computers, high-speed internet, fax/copy service, office supplies, shipping and packing services, postage, overnight courier service, and an ATM machine. From Seattle-Tacoma International Airport: Take Interstate 5 North and exit at Seneca Street (left lane off the exit ramp). Turn right onto Sixth Avenue and the hotel will be 3 blocks down on the right hand side. From North: Take I-5 South. Take the Union Street Exit. Proceed for one block and the hotel will be on the right. From East: From Interstate 90 West, proceed to I-5 North and exit at Madison Street. Turn left on Madison and then right on Sixth Avenue. The hotel is 4 blocks ahead. State-of-the-art Fitness Center with treadmills, ellipticals, bikes, and resistance equipment. 15 miles from Seattle Tacoma Airport. 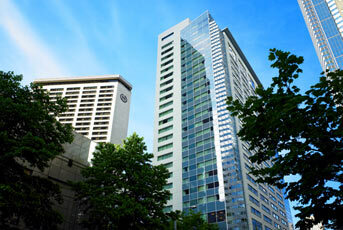 Sheraton Seattle Hotel is a proudly pet-friendly hotel. Dogs weighing up to 40lbs are welcome. 40' lap pool with natural sunlight and spectacular views. Inspired by the great city grills of yesteryear with intimate booths, private dining and fashionable bar, Daily Grill offers an All-American menu featuring dishes that are well prepared and reasonably priced. Highlights include chops and Certified Angus Beef steaks, fresh seafood, classic Cobb and Caesar salads, traditional-style entrees, homemade desserts, and one of the best martinis in town. 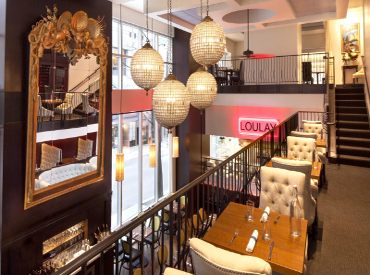 Open for lunch and dinner, Loulay Kitchen & Bar is our signature restaurant experience. 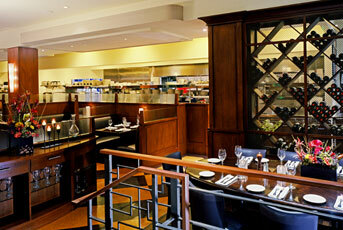 Enjoy modern French cuisine by heralded Seattle Chef Thierry Rautureau. Adjacent to the Washington State Convention and Trade Center.